Welcome Fall! I'm celebrating cooler weather and the change of seasons with a group of our blogging friends. You're invited to share your fall themed posts with us from September 17th to October 18th. Any and all fall posts are welcomed: crafts, DIY projects, recipes, activities, etc. Be sure to come back on October 22nd and check out the features! Is anyone else ready for fall? I sure am! I do love summer and all the fun it brings but there is nothing quite like fall in New England. I love the cool crisp mornings, all the beautiful colors that the leaves are turning, and the tastes of apple, cinnamon, pumpkin and cranberries! 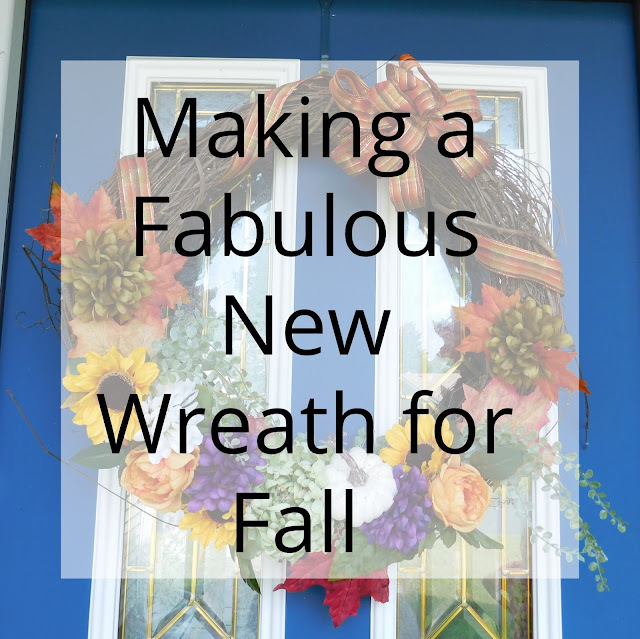 I made this brand new fabulous fall wreath for our front door and included a little tutorial on how I make wreaths in general. There is nothing quite like a new wreath to ring in a new season and welcome friends and family to our home. Each co-host is sharing a fall post to get the party started. You’ll find their links in the Link Up below. You're sure to find lots of inspiration! Please visit their links and check out their posts. We would all appreciate your support of the party by pinning our projects. The party is for all things fall! Share your crafts, home decor ideas, diy projects, recipes, and activities. By adding your link you give the co-hosts permission to use one photo with a link to your post on social media or in round up posts. Each co-host will share a features post of their favorites from the party on October 22. Wow! It is gorgeous! You are talented mama! I have shared all my pumpkin posts, lol didnt mean to over do it!! THanks too for stopping by this week to share your party!! Oh I'm sure it's fine! The more the merrier; right? !